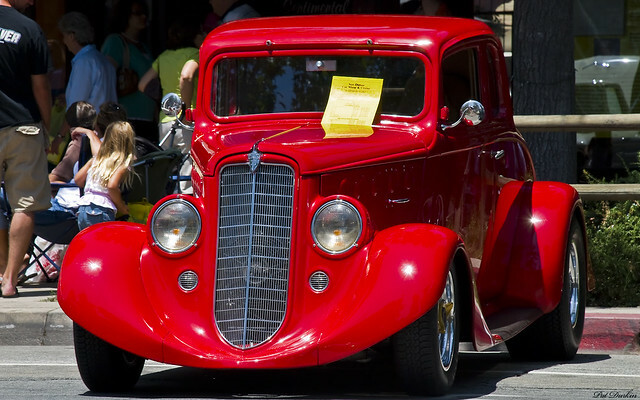 In the aftermath of 1929 stock market crash and subsequent financial crisis, many automotive companies lost their economic backing and were forced to close. Others quickly lost their clientele and ceased to exist. Remaining companies struggled to stay alive, often drastically changing their business philosophy. 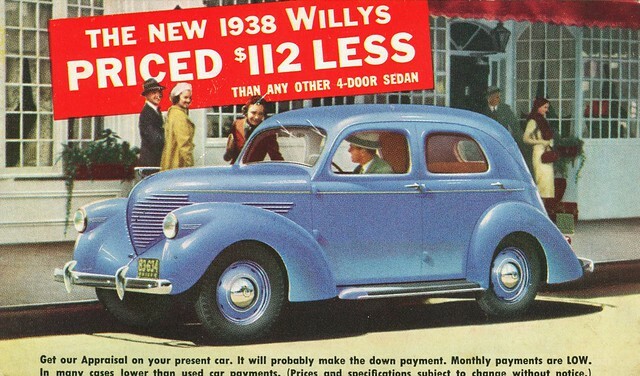 Willys-Overland (traditionally focused on mid-sized cars) decided to bet its dwindling bank on a new low-priced small car, which it managed to develop for next to nothing. 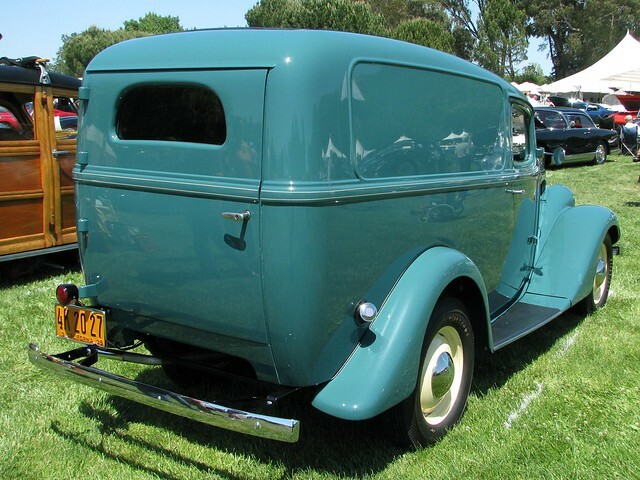 Called the Willys 77, it was unveiled in June 1932 with a 100-inch wheelbase and an ultrathrifty four-cylinder engine making 48 bhp from 134.2 cid (2,388 cc). It was offered from early 1933 through 1936. The most attractive features of this small semi-streamlined car were the price (below $500) and fuel consumption (9.4L/100 km). It was not fast but a tuned-up 77 could make 60 mph and even a bit more. 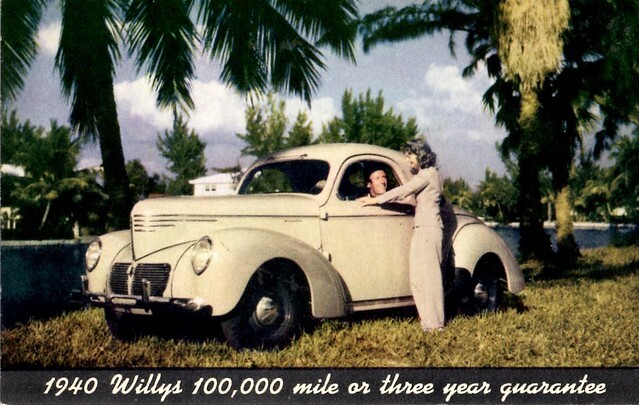 Unfortunately, financial difficulties prevented the 99 from being produced and 77 remained the only model in Willys catalog. The 1933 reorganization ushered in a new chairman, the bespectacled Ward Canaday. A pillar of the Toledo business community with a strong sense of loyalty to his employees, Canaday ached to get things moving again. His first real chance came with the 1937 line, for which he ordered a full restyle. The result was less than ideal, with lumpy looking rounded bodies carrying pontoon fenders and a bizarre bulging front not unlike that of Graham's forthcoming "sharknose." The new sheet­metal increased overall length by over a foot to 175.5 inches. 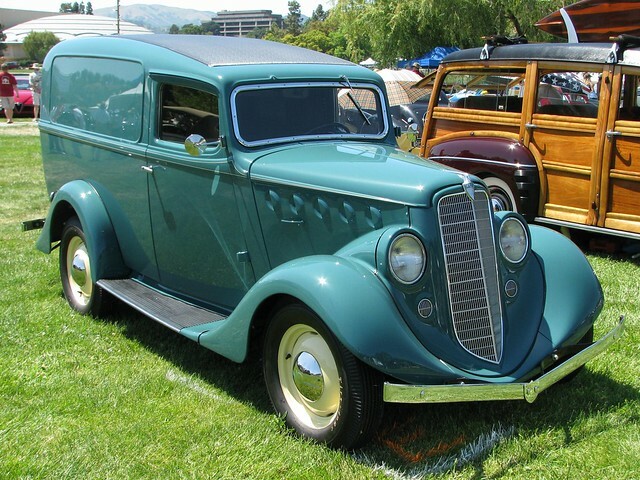 Again, only a coupe and sedan were tried, albeit in standard and DeLuxe variations. Priced from $500 to near $600, these new Model 37s met with some success despite their odd looks, and model-year volume shot up to 63,467. 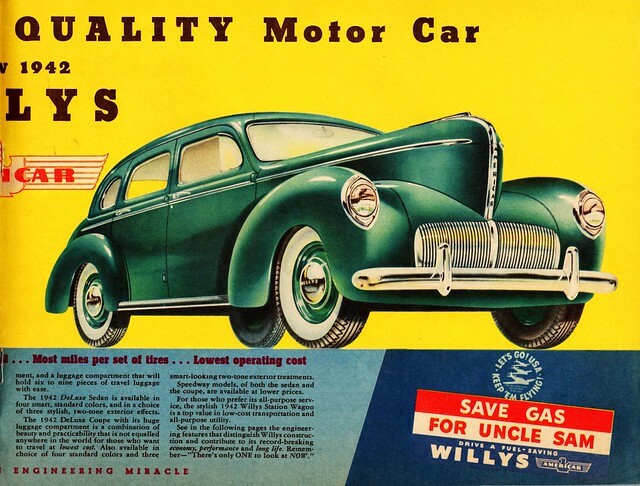 But 1937 was a recovery year for most of the industry, so despite building twice the number of cars it had in '36, Willys only improved from 15th to 14th in the overall standings. 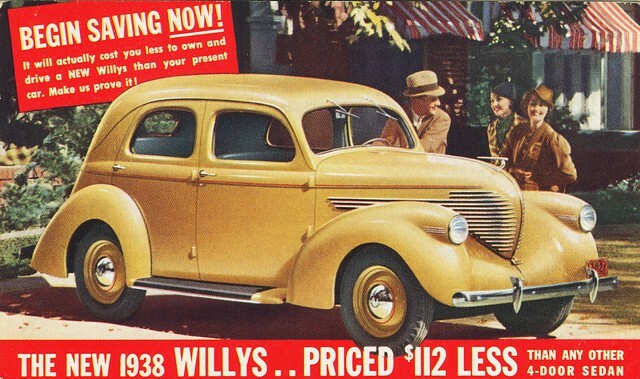 The 1938 recession resulted in dramatically lower sales, pushing Willys back to 16th. Changes for that year's Model 38 were few, but offerings expanded with a pair of two-door sedans called Clipper. 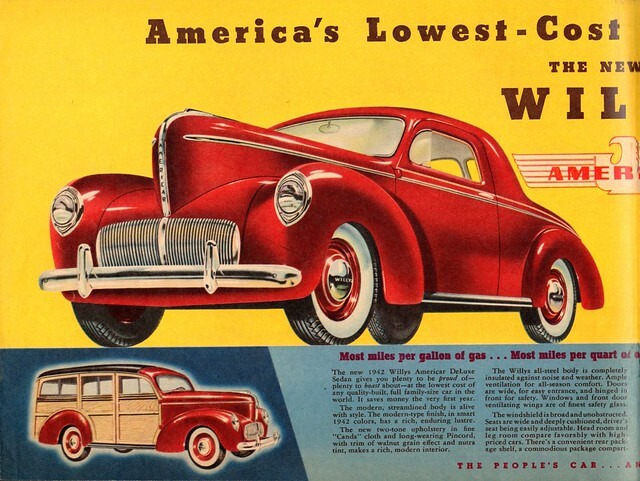 A sharper prow announced "Slip-Stream" styling for 1939, and the lineup again included Overlands: standard, DeLuxe, and Speedway Special sedans and coupes with two extra ­inches of wheelbase ahead of the cowl. Designated Model 39, Overlands differed from that year's Model 38/48 in having standard hydraulic brakes, larger tires, headlamps carried in ­fender-top pods rather than within the fenders, and 62 bhp. 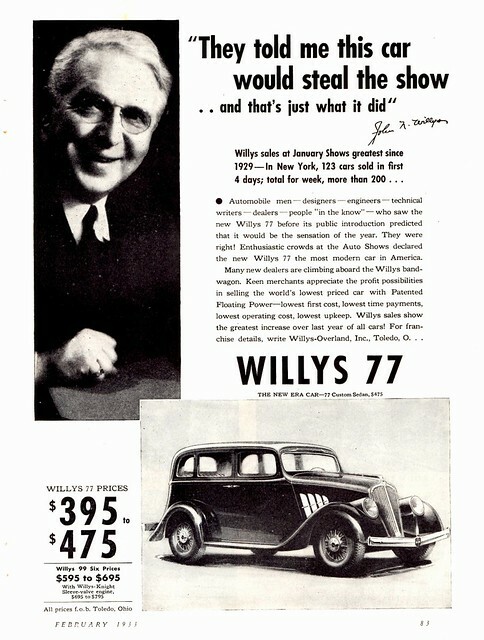 Overlands cost an average of $100 more than other Willys models, but the extra money bought markedly better performance. 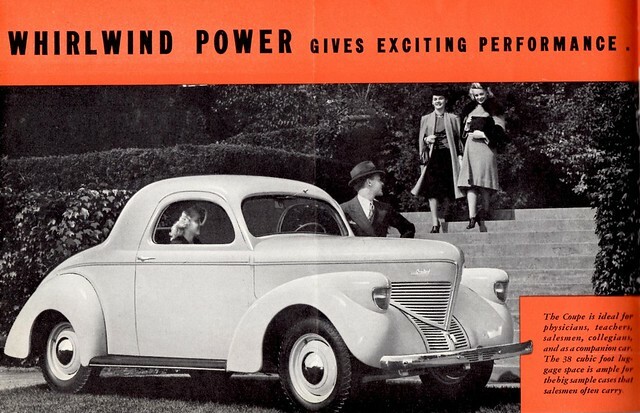 Former Studebaker engineer Barney Roos had coaxed extra power out of the old four via higher compression, an improved carburetor, and a new camshaft. Dubbed the "Go-Devil," this engine would impress the Army and power wartime Jeeps. At $596-$689, the Overlands were still some $32 below the cheapest Chevys. 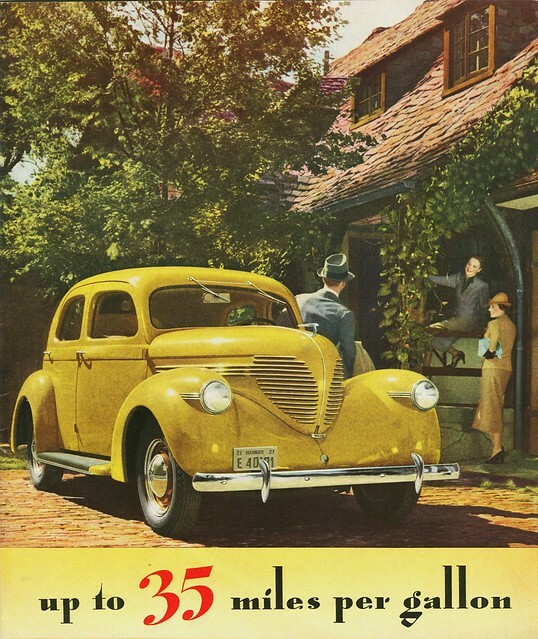 As a result, Overland's model-year production was fairly respect­able. 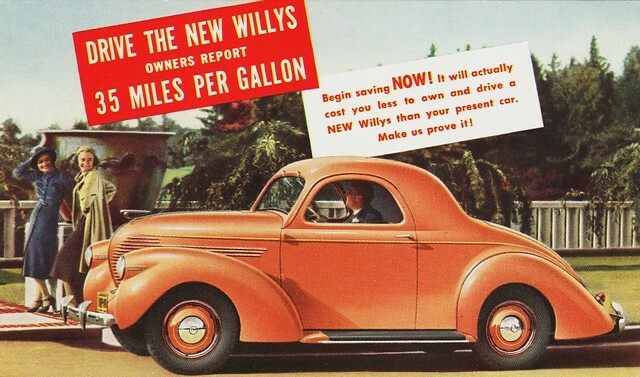 But total Willys output was only 17,839 -- a worrisome decline in a year when most automakers did better than the year before. 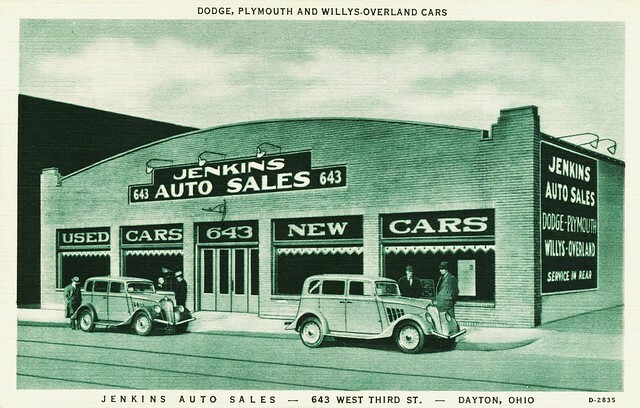 It was in 1939 that Joseph W. Frazer, the dynamic sales manager of Chrysler Corporation, went to Toledo and W-O as president and general manager; Canaday remained board chairman. 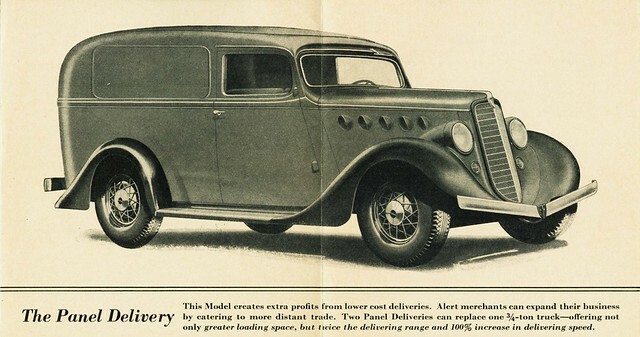 Frazer knew how to cut losses, and decreed more orthodox styling for 1940. 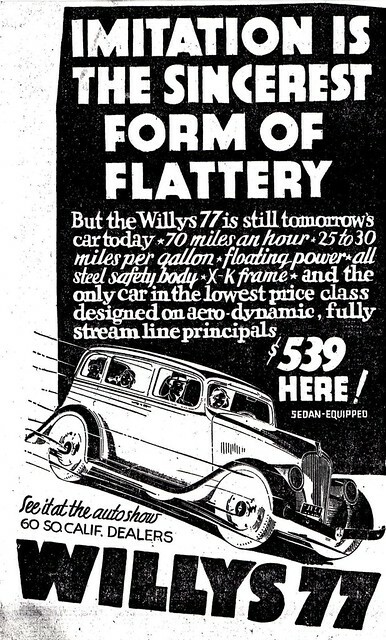 Still, it's doubtful even he could have saved Willys' passenger cars. 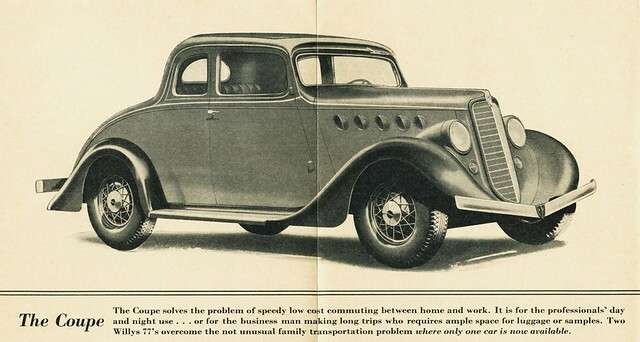 Designated Series 440 -- for four cylinders, 1940 -- Frazer's revised models were essentially '39 Overlands with sealed-beam headlamps and a vertical prow (instead of undercut). Model-year production improved to nearly 27,000. Frazer and company made further improvements for the following year's Series 441. 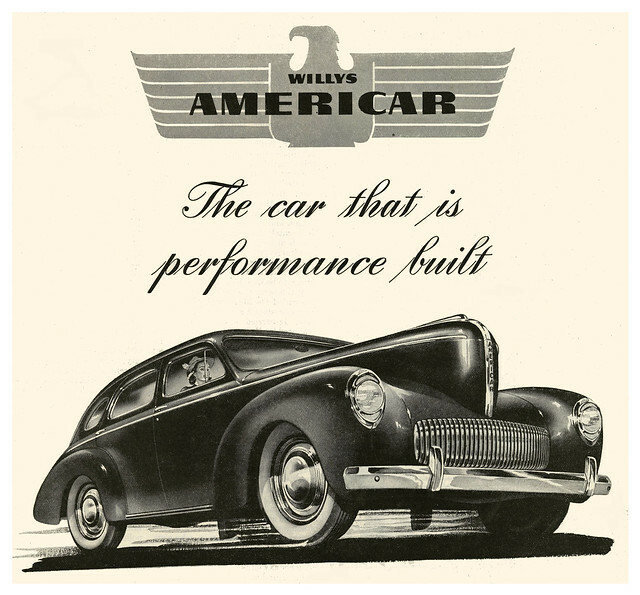 All models were dubbed Americar, providing patriotic appeal, and gained two more horsepower and two more inches in wheelbase. Models expanded to seven with the addition of a new Plainsman coupe and sedan. 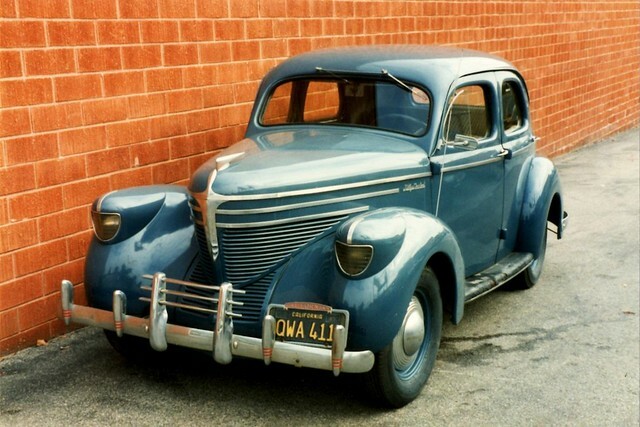 Frontal styling was now quite Ford-like, with an even shapelier nose above a small vertical-bar grille. Prices were hiked nearly $100, now ranging from $634 to $916. Loyal to '42 model, I presume. But Groucho was a 100% loyal DeSoto man. The Americar looks like Groucho Marx!